Remember when the holidays were all about simple pleasures like spending time with family and exchanging modest gifts? Neither do I. Holidays have taken on a life of their own, turning otherwise reasonable folks into consumer zombies and blowing up the budgets of too many Americans. This year, let's celebrate simplicity and financial solvency. 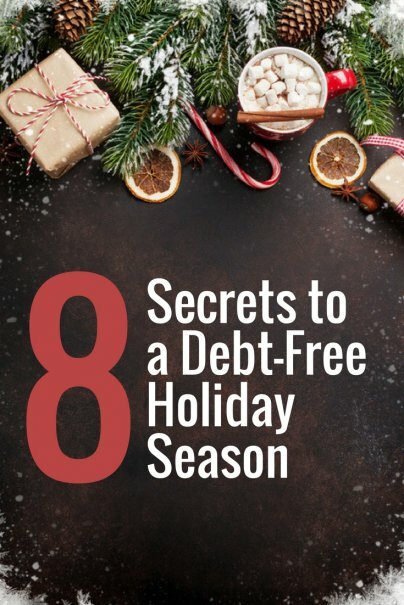 Here are the secrets to a debt-free holiday season. 1. Push back against "holiday sprawl"
Holidays can be frantic. In the rush of activity, we often make bad decisions about what to buy and how much to spend. Slow. Things. Down. Break up your shopping excursions into several smaller trips and avoid shopping on days when you have a thousand other things to do. When shopping online, load your virtual cart, but don't commit to buy until you've thought about your choices overnight. The holiday season can make or break retailers. To help us stretch our spending muscles, almost every store features blowout sales or deals that require the purchase of multiples (10 for $10). My advice? Be skeptical. That "biggest sale of the year" probably isn't. And what are you going to do with 10 bacon-scented candles, anyway? Do you tend to spend more when you use credit? You're not alone. Paying by credit card — or worse yet, smartphone — blunts the conscious connection between spending more money and having less money. Make this holiday a cash-only affair. It'll keep your accounts in the black and make your first credit card bill of the new year a lot less frightening. I didn't get the memo: When did everyone decide that $14.99 is an acceptable price for a box of holiday cards? This year, save a few bucks by ditching the costly cards and postage. Instead, send a group email or catch up with a leisurely phone call. If money's tight, swap traditional gifts for the gift of time together. Organize a holiday potluck, host a movie night with friends, or coordinate a charity event where everyone contributes a few hours of their time as a group. After all, what could be better than good food, good friends, and goodwill?